Sky UK has recently moved the whole of its Sky News operation into new, state-of-the-art facilities in the Sky Studios building on the Sky TV campus in Osterley, West London. Described as being both the most sustainable broadcast facility of its kind in Europe as well as the most technologically advanced, the Sky Studios project is set to completely change the way that Sky TV works and the scope of content they deliver. Currently, the main areas that have been moved over to an IP workflow are the mix/monitoring systems in the production galleries and in-ear mix/monitoring systems for the presenters. Both solutions were supplied by British broadcast audio equipment specialists, Sonifex, with the IEM mixer systems being specially designed for Sky TV to their bespoke specifications. Regarding the Presenter in-ear monitoring systems, the challenges were rather different. Sky News presenters are used to having full control of each individual source that they hear in their IEMs while on air. Previously this had been achieved with a small local mixer that was fed with four sources: PTB (open talkback from the gallery director); switched talkback (producer key to presenter); programme sound source (playback or live external feed); and custom source (non-programme sound source monitored for up-to-the-minute info, e.g. sports commentary, news conference, translation etc.) Later solutions provided serial control of centralised mixers but still required audio control to be routed separately. Sky approached Sonifex for a design that provided multiple centralised mixers controllable by presenters and/or technicians in parallel, with routing in and out of the mixers on AoIP, and audio delivered to a headphone jack on the controller unit. Additionally, because control of studio floors is frequently switched between galleries, Sky needed the ability to switch groups of remote controllers (presenter units) between different mix engines. The remotes needed to be small and ideally powered on the same connector as the data and audio. Sonifex developed the AVN-MPPR 4-channel AES67 presenter in-ear monitoring remote controller. An 8 x 4 channel mix engine at its core enables up to 32 remote presenter units to alter the mix output levels of one of eight Virtual Mixers (VMs), each one of which offers four mono channels. Multiple units can simultaneously control any of the eight VMs in the main mix engine with the VM number displayed on the front panel. 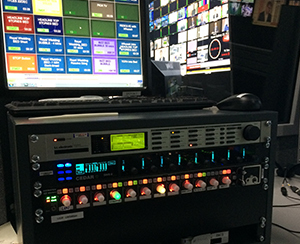 A technician version of the remote located in the Sound Control Room is able to oversee all eight VMs and adjust levels for presenters if required. Audio is transported from the main mix engine to the remote units via RAVENNA/AES67 with a single PoE (Power over Ethernet) Neutrik Ethercon network connection.